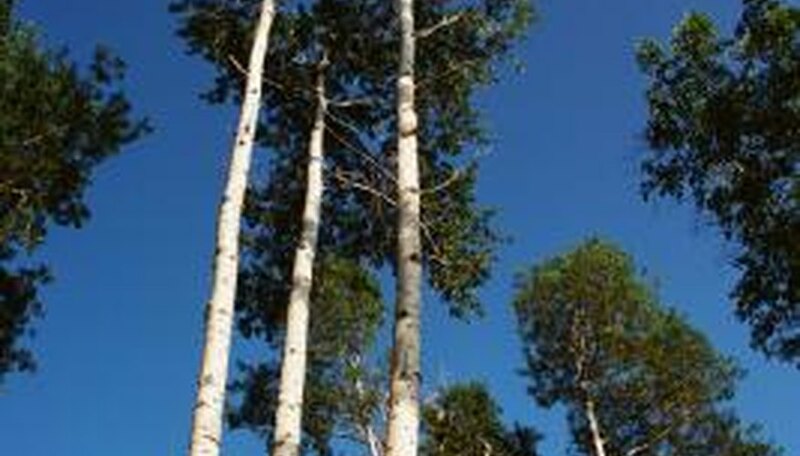 Poplar trees typically have short lives and can reach heights of 50 to 100 feet. They grow in wetter areas, such as lowlands, flood plains and river valleys. Poplar wood ranges from hardwood in yellow poplars to softwood in cottonwood and aspen trees. Poplar trees are used in landscaping as well as wood sources for large-scale production for various industries. The wood's thickness, hardness and other factors determine what manufacturing process it goes through. The home construction industry uses poplar wood inside and out. The three types of poplar trees used in constructing houses are: yellow poplar, Eastern poplar, also known as cottonwood, and hybrid. Poplar wood is readily available and relatively inexpensive. It is used for siding, wall sheathing, sashes, interior trim, molding, doors and cabinets because of how easy it's able to take and hold paint. It's also used to make roofing felt, plywood, ceiling tiles, house frames, hardwood floor core, I-joist webs, and insulation boards. Poplar wood is easy to work with and resists splitting when taking nails or screws. Hybrid poplars as well as many other members of the Populus family of trees are used in residential plantings. With quick-growing hybrid varieties, you can have a shaded yard fast. The trees are also used for privacy screens, windbreaks and snow fences. Poplar varieties used in landscaping include Lombardy, white, southern, Carolina and balm of Gilead. Poplar wood that is soft, such as that of Eastern poplar, quaking and bigtooth aspen, is ground into pulp to make a variety of paper products. High-grade, glossy paper used in books and magazines is usually made from Eastern poplar. Quaking aspen is also used for magazines and books, but produces a lesser grade of paper. Bigtooth aspen and swamp poplar wood are used to make paper pulp as well. Other paper products manufactured from poplar trees include napkins, paper towels, fine paper, tissue and paper board for packaging. A variety of common products are made from the wood of poplar trees. The chopsticks at a Chinese restaurant may be made from poplar. Eastern poplar, though it's a softwood and has a tendency to warp, is useful for making shelves, crates and boxes. Other items made from poplar wood include chair backs and seats, furniture frames and components, containers, fruit baskets and display racks.